It really is a no-brainer with minimal prep time. We used Applegate-brand ham slices along with eggs and chopped veggies to create these awesome egg cups. We know it’s hard to cook up breakfast when your working or have a busy morning. That’s why we like to make a batch up of these on Sunday, put each one in a baggie, and have breakfast ready to go for a few days during the work week. If you have kids, these little pockets of protein are perfect. Heat up an egg cup and serve it with a little fruit before school and they’re good to go. And you’ll feel good feeding them a long-lasting, energy-packed breakfast. I know egg cups have been done before. But I love this recipe for its simplicity. It’s one you’ll want to make over and over again I’m sure. Tasty little savory cups with a hint of peppers and a little cream from the coconut milk. Give them a try and add whatever other yummy ingredients you like or happen to have on hand. How long would these last in the fridge? How do you reheat it? Microwave or oven? Great recipe. I’m not on a paleo diet so I substituted cottage cheese for coconut milk. I also added spinach and they were very yummy! Just made these day. Delicious!! Thanks! 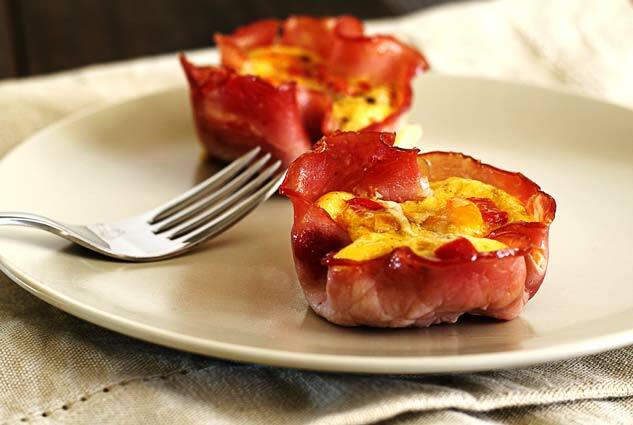 Ham and Egg Cups: Easy, quick and delicious. I put diced tomato and green chiles in mine. Excellent recipe! Thank you. Do you have to use milk? I usually whisk my eggs with water? Oohhh perfect to pack for work! Those look yummy! How long do you reheat them?